News in Slow Italian Review – Lots of Fun! 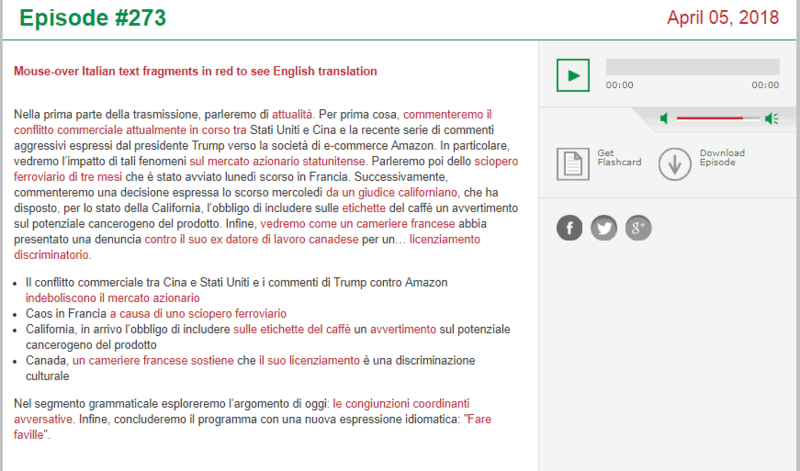 Summary: News in Slow Italian is an excellent learning resource; it’s very comprehensive and offers all the necessary tools to be able to practice all the aspects of the language. It’s also one of the most fun and original language learning tools I’ve seen and manages to be so without sacrificing on quality. 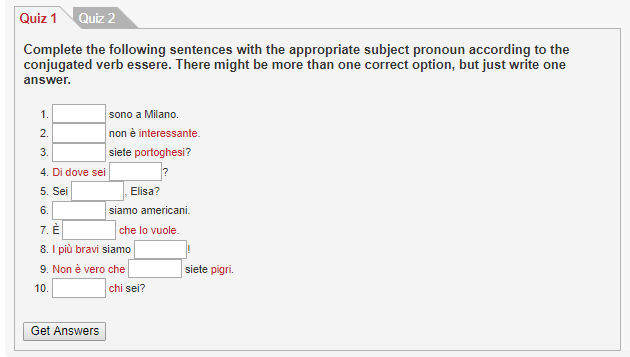 This program is helpful for anyone who wants to learn Italian. They really thought of everything when creating this program – audio lessons, pdf files, exercises, grammar and expressions catalogs, podcasts. Clear and explanatory grammar lessons, expressions and idioms included in every lesson, lots of vocabulary to practice and plenty of information to help you become fluent. 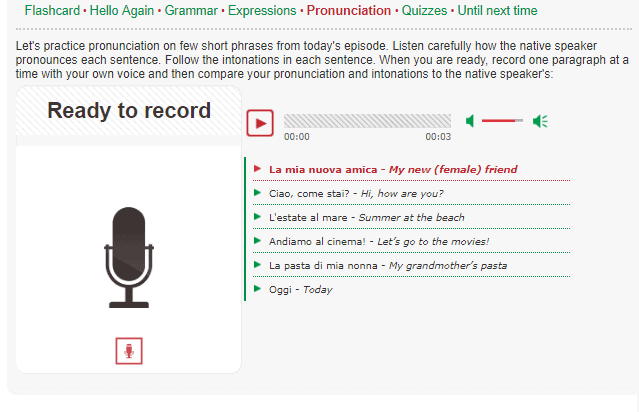 News in Slow Italian is a great learning resource and students of all levels should try it. 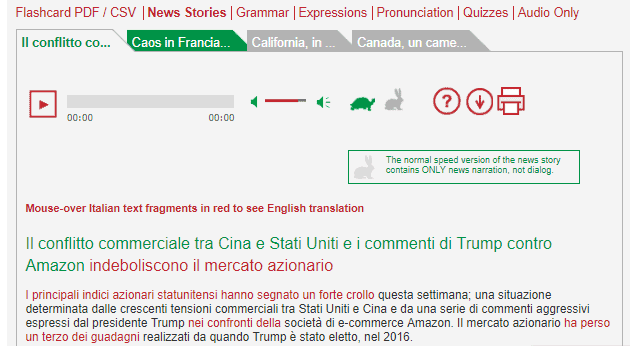 News in Slow Italian is a brilliant learning resource that offers students of all levels a great opportunity to improve their Italian. The lessons are very thorough, containing a lot of information with plenty of explanations and cultural details. The resource offers three courses: beginner, intermediate and advanced. All of them are equally valuable and helpful as an independent source of learning or as a complementary resource. 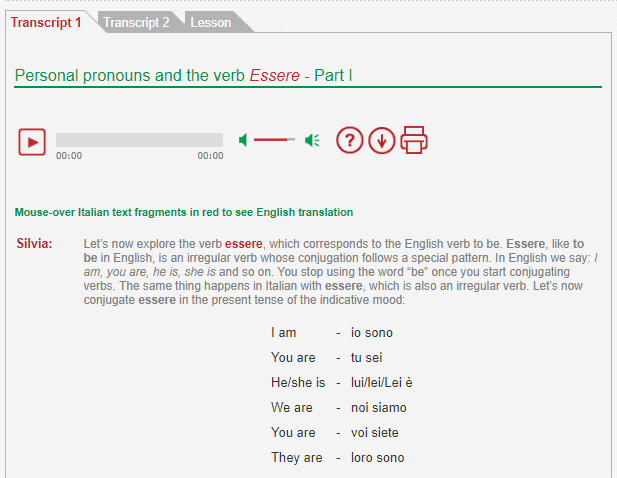 News in Slow Italian has it all – fun lessons, easy to browse, easy to understand grammar explanations, practice exercises, podcasts, and catalogs with extra information for the diligent students. 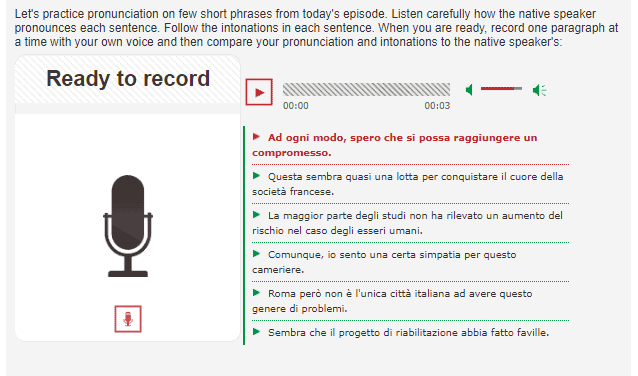 News in Slow Italian is split into three modules: beginner, intermediate and advanced. The structure of these differs from level to level. The beginner course is presented like a theater play and all of the lessons are acts. It’s just such a fun way to study this level! The intermediate module starts to include more complex lessons, the very wide-ranging expressions catalog, the grammar catalog, audio news, and more downloadable materials. The advanced course is addressed to a higher level of students as it offers a lot of lessons that include a deeper look into the Italian language, grammar, and culture. The resource has a lot of downloadable materials, documents and audio files, flashcards with vocabulary items and many other sections. We’ll now take a closer look at what exactly is included in each of the different levels. News in Slow Italian sure knows how to combine useful with fun. Their beginner module is structured in a Language Theater course, this is both a course and a play, really! They went outside of the box and named the lessons “acts”. They structured the lessons in a longer theater play (22 acts), each of the acts having vocabulary, grammar, exercises, and dialogues included. If you click on the acts, a drop-down of the lesson is displayed, showing you the main topics you learn about in that particular lesson. The lessons have a very clear and well-organized structure, very comprehensive and explanatory. Each act has an opening dialogue where the narrator presents the lesson and informs the student of the main topics included in the act. This dialogue can be listened to or read, both options are there. This feature is available on all sections of the lessons. There are a few sections under each act title that helps the student navigate through the lesson. If you click on flashcard you get to download a pdf file with the vocabulary present in the lesson and the English translation for the words. Clicking on Hello Again takes you to the conversation between the actors, where you have the options of listening, reading it, downloading the materials (mp3 & pdf) and you can also see the shortcut keys. The written part of the conversation is very nicely designed – it has pop-ups with words translated, so it’s easy to check the meaning of it when hovering with your mouse. 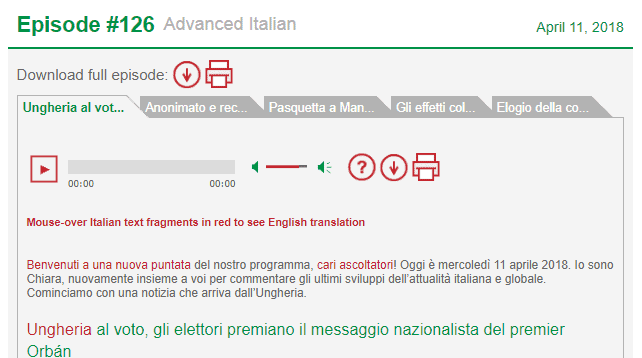 The Italian words that have a translation pop-up feature are marked in red. The Grammar section is a pleasure to browse. It’s extremely organized, extensive, and easy to understand This grammar section is impressively well put-together. There are three tabs under this section: transcript 1, transcript 2 and lesson. Transcript 1 and 2 offer thorough explanations to various grammar topics, split into parts, just to make sure the student doesn’t get overloaded or confused by the information. 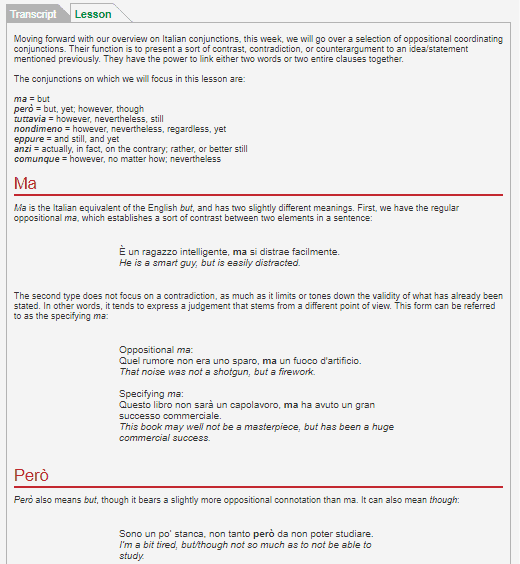 The lesson part is a summary of the grammar rules included in the lesson, explained in details as well. It also presents some vocabulary items, for example, greetings and how to introduce yourself. 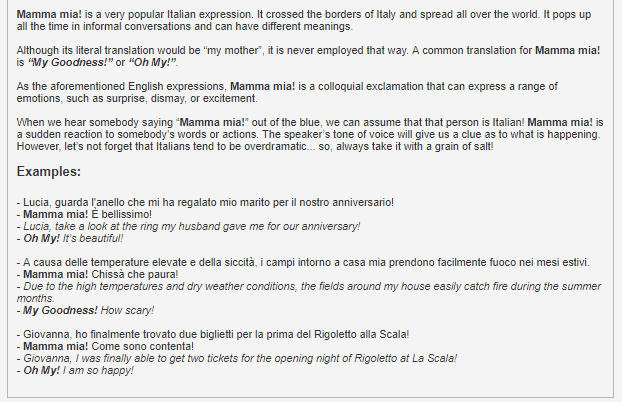 The expression section offers various idioms or common phrases that Italians use, for example, Mamma Mia. This section includes a conversation where that particular expression is used and also a lesson explanation with more information about the origin and usage of the phrase. The Pronunciation tab allows the student to practice through the recording feature. Most students would benefit from personalized feedback from a tutor to provide feedback on their pronunciation. On italki, you can find tutors for less than $10/hour. Quizzes are exercises to test your knowledge. Until Next Time is practically a closing dialogue of the lesson. The intermediate course is spread into weekly news episodes. As a user, you have the possibility to see all older episodes they uploaded on the site. Each episode comes with multiple options of learning, or better said, multiple sections for a lesson. The Flashcard section allows you to download a pdf or an excel file of the vocabulary presented in the lesson, as well as their English translation. News Stories offers a few stories with a more complex vocabulary, with the audio option included and downloadable materials. The Grammar section has a transcript section where you can listen and read a conversation; here as well we can see the translated pop-ups in the text. The lesson tab explains grammar rules and usages. 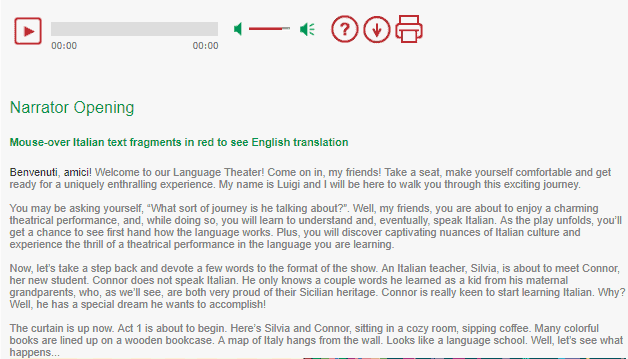 In the Expressions tab you get to listen and read a conversation, see the words translated in the text and also learn more about the vocabulary in the lessons section. The Pronunciation tab gives you the opportunity to practice your vocabulary. 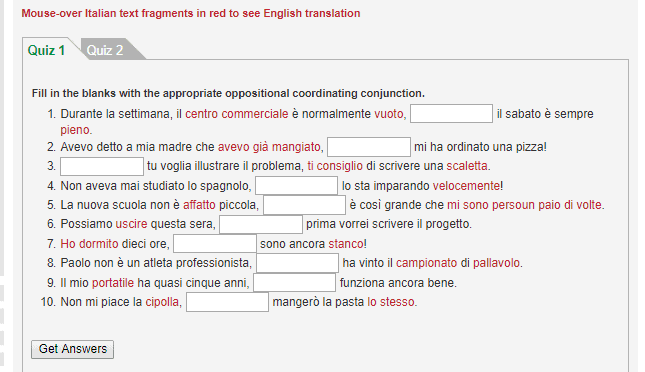 Exercises are present in the form of quizzes, where you can fill in the blanks. The Audio Only section takes you to a different page where you can download the materials and listen to the episode. A very interesting feature that they added to the intermediate level is the catalogs. There are two catalogs in this course: the expressions one and the grammar one. They both represent an extra resource of learning and they are fabulous! The ambitious students will definitely see the value in these. The grammar catalog covers all of the grammar topics that the student needs to study and they also come with audio features, translated words, explanations, and exercises. This catalog takes you to a new level through the expressions they added in the catalog. These are really helpful to get a better insight into the Italian vocabulary. The Advanced course is very similar in structure to the Intermediate one because it’s also based on episodes, except here vocabulary and grammar are much more complex. The episode structure has mostly audio lessons; however, you can also download the pdf file with all of the texts. You get access to older episodes too, in this course they are called podcasts. 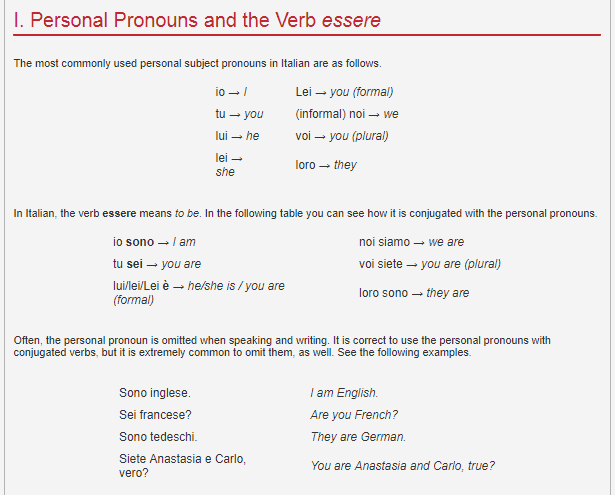 The catalogs for grammar and expressions are also available and they have the same structure as the intermediate one. Regardless of what lesson you study, they offered a fun way to study Italian and made sure it’s a productive one as well. 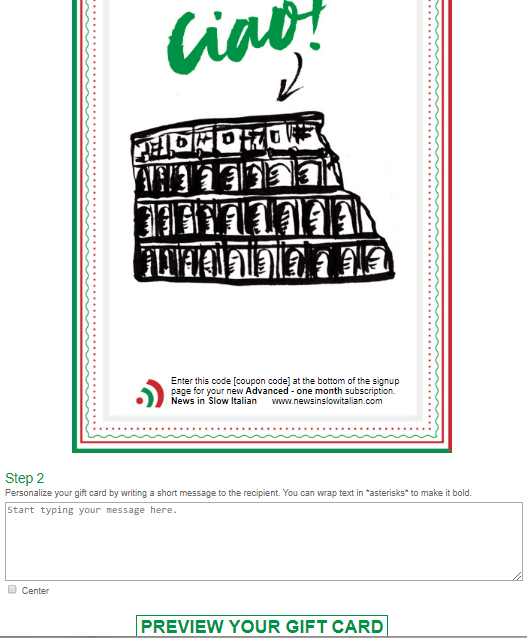 News in Slow Italian allows you to gift a subscription and personalize it as well with a message! You have to choose the subscription first, then write a message for your friend on that card and add an email address where the code will be sent to. This feature is available for all three courses. Since their program is so complex, they offer subscription at a special price for schools, teachers, universities and so on. 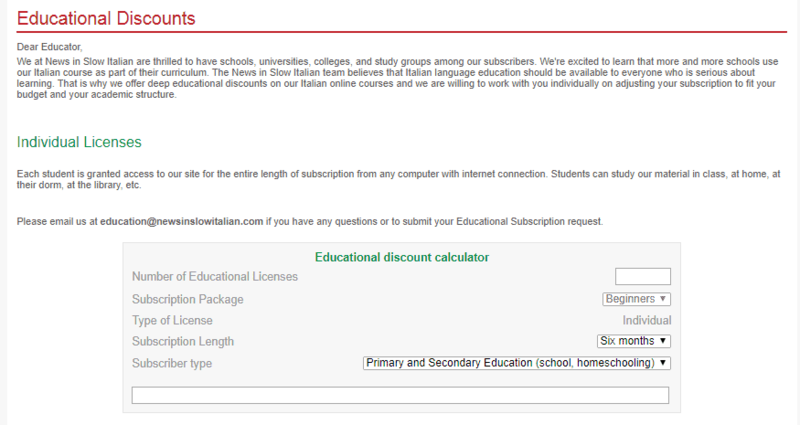 They provide a calculator on the page so you can choose how many subscriptions you want, what type of lessons you want included and based on the information you add, they offer you discounts. Love, love, love this program! I love the way they structured the modules and their lessons. They included the fun factor into them as well – the language theater idea is so original! There is plenty of vocabulary to learn, grammar is explained in a very clear way and exercises are available too. You do not get the chance to get bored with this one. All three levels have great content, a lot of information to go through, and enough audio lessons to get you used to the natural native tonality and cadence. It’s an affordable resource and doesn’t cost a lot for what it offers. Once you start using it, it will grow on you and you will realize just how much it can teach you. It’s definitely worth spending money on! I have tried to look for less enthusiastic opinions on the internet about this program… turns out there aren’t any bad reviews about it out there. The only thing I could find was the fact that for some people, it can be confusing having so much text and conversation, but that is really a matter of preference in the end, not a faulty feature of the resource. I did find a lot of praising words for it and I absolutely agree with them: News is Slow Italian is outstanding, fantastic, smart, fun and thought-provoking!